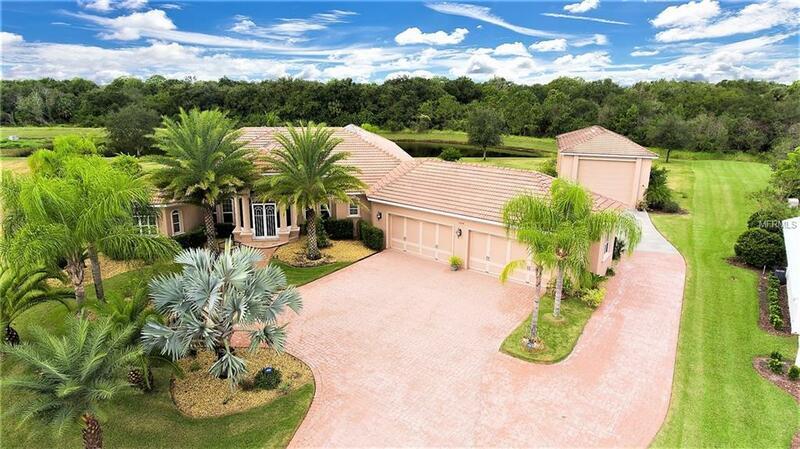 Located on a rare 11ac cul-de-sac of a Peaceful preserve & pond. Custom Mark Cahill Home with 4 bed, 3 bath + bonus room & office.4 car attached garage with separate RV Garage accommodates a 45 ft RV or boat. Huge screened lanai with full outdoor kitchen and a cozy fireplace. Enjoy your Sparkling salt water, solar heated pool with floor jets for easy self cleaning. Gas heated spa provides perfect temperature at a moments notice. Enter the Double doors to the open formal living & Dinning room w/a tray ceiling, fireplace, w/accent pillars, pass-thru dry bar and Store your favorite wines in Custom Crafted walk-in Wine Cellar . The gourmet kitchen features stainless steel appliances including gas stove & Maple cabinets granite counters, breakfast bar & breakfast nook w/aquarium window. Challenge your friends to a game of pool in the bonus room with unique corner windows. The Elegance Large Master Suite & spacious master bath w/a walk-in Roman shower & a relaxing Jacuzzi tub. 8 KW Solar PV system will give you that energy saving peace of of mind. Newer 3 HVAC systems that are zoned controlled. 2 Mitsubishi units gives you extra flexibility in cooling efficiency. Easy clean up with the central vacuum system. Twin Rivers offers acres of nature preserves, wildlife, a fishing dock, a new boat ramp on Manatee River with waterfront recreational and picnic area, and Canoe Launch. All of this just a few miles from the Ellenton Outlet Mall, UTC Mall, minutes to I-75, and easy commute to Tampa, St Pete Sarasota, and Bradenton.